On the afternoon of Sept. 7, 2011, an airplane carrying nearly all the players from the Kontinental Hockey League's Lokomotiv Yaroslavl ice hockey team crashed less than 2,000 feet after takeoff for Minsk, Belarus. Of the 45 passengers, only a flight attendant survived in one of the deadliest aviation accidents in the history of sports. Yaroslav Lokomotiv was given a one-year hiatus from the KHL to rebuild its program. The team this month returned to compete in Russia's top league with a remade roster featuring players promoted from the club's farm team, as well several imports from North American hockey circles. The recovery for Lokomotiv Yaroslavl began with a phone call from a stranger. "I contacted [the club] and said I'd be happy to give a hand," former NHL general manager Mike Smith said of reaching out days after the tragedy. "They were in deep shock. It was a catastrophic incident." Hoping to salvage Lokomotiv's 2011-12 season, the Kontinental Hockey League offered to help assemble a new team. But it wasn't the right time for club president Yuri Yakovlev, who played for Yaroslavl before taking it over in 1989. "They're used to having a Yaroslavl team. They were going to concentrate on their younger players and youth program," Smith said. "When they decided it would be in their best interest to rejoin the KHL, they would." 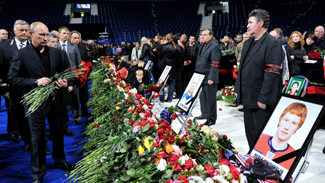 Tributes immediately poured in, including a tearful memorial at the Minsk arena where the team was scheduled to open the season. By January, Yakovlev was ready to begin assembling a new team and he called Smith, who recommended former Carolina Hurricanes assistant Tom Rowe for the coaching job. Brad McCrimmon, a Stanley Cup-winning player and former NHL assistant who died in the crash, made his mark in the short time he served as Lokomotiv's coach. Continuing McCrimmon's plan became a priority for Rowe, who previously worked as coach of the Hurricanes' American Hockey League affiliates in Lowell and Albany. "When I was in Lowell, Mike Milbury called and said Brad wanted to get into coaching. So Brad came up and we spent a couple of hours talking about coaching. We got to know each other pretty well," Rowe told NHL.com. "I look at this as an opportunity to continue Brad's great work. All the people here absolutely loved him. I want to make him proud. Everybody here is focused to make sure we have a great season to celebrate what that team started last year." Rowe added former NHL players Dmitri Yushkevich (who started his pro career in Yaroslavl) and Nikolai Borschevsky (a former Lokomotiv coach) as his assistants. They joined a staff that included Jorma Valtonen, one of only two members of the club (along with player Maxim Zyuzyakin) not to travel with the team that fateful September day. In assembling the roster, young prospects quickly went from being Lokomotiv's future to being their present. Many of them represented Yaroslaval last season in the VHL, a second-tier league below the KHL. Now called upon to represent Lokomotiv in Russia's top league, they're joined by former NHL players Viktor Kozlov, Curtis Sanford, Vitaly Vishnevsky, Niklas Hagman, Sami Lepisto and Mark Flood, who played under Rowe in Albany. "Mark is a guy that I contacted fairly early. Having him brings a nice comfort level. He knows exactly how we want to play," said Rowe, who sees similarities between this club and his 2004-05 Lowell team, which featured several players who won the Stanley Cup a year later with Carolina. "We had Eric Staal, Cam Ward, it was unbelievable. This is the most talent I've had since that team." Lokomotiv's exhibition play started in early August with a 4-1 loss to CSKA in Moscow, with hundreds of Yaroslavl fans turning out to support the squad. The emotional preseason included a memorial game held by the Swiss League's Kloten Flyers, in which they played a team of NHL stars that included Evgeni Malkin, Pavel Datsyuk and Ilya Kovalchuk. On the anniversary of the crash, and with training camp now finished, the rebuilt Lokomotiv Yaroslavl team is ready to embark on a season in which it will be playing for more than just wins. "It's a unique situation. We're playing for the city and we're playing for the guys who passed away. It's a huge honor and we want to perform well," Lepisto said. "Coach Rowe said we're here to win a championship. We have a good team and this is [a] realistic [goal]." That goal seems even more realistic following the team's 5-2 season-opening win at Sibir Novosibirsk. After falling behind 1-0 just 3:34 into the game, Lokomotiv rallied for the victory. The charge was led by former NHL player Staffan Kronwall, who contributed two goals, including the game-winner. But the club's season starts in earnest on Sept. 16, when Lokomotiv will play its home opener against Mystishchi Atlant, which knocked Yaroslavl out of the 2011 KHL conference finals in the club's last meaningful match before the tragedy five months later. "It's going to be very emotional," Rowe said. "We want to celebrate that team with a tremendous season."